Hi there, my name is steve. I would like to ask you about the best way or the most efficient way to supply LEDs. there are 36 small LEDs or 72 small LEDs (5mm). Remember that the LED for lighting or otherwise needs to be protected from over current on Forward Bias and High Voltage connection in Reverse Bias. That means you could use a 3 A Diode like 1N5408 to prevent wrong polarity connection. Then all you need a constant current source with a voltage output a little above the product of the Number of LEDs and Forward Drop of a LED. 5 LEDs in Series with a forward drop of 3 each means 5 x 3 = 12. You need a 15 Volts Regulated Supply with a current limit of around 30mA or more. See the LED datasheet. Go beyond limits you lose your LEDs the same day or months later. 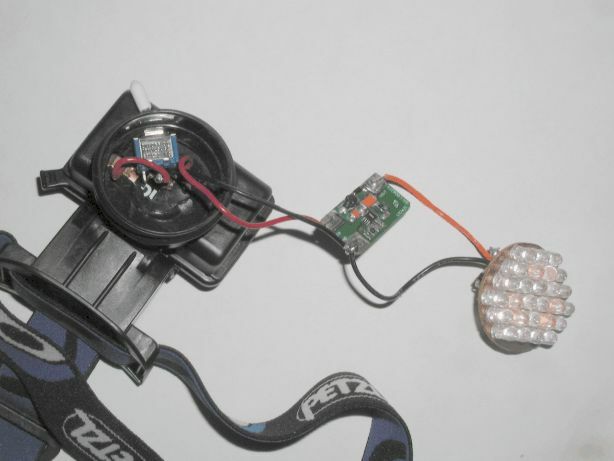 "The perfect LED light is designed for cavers who want an efficient, uniform and constant bright light for caving. This article contains some very specific technical information and it is assumed the reader has a basic understanding of electronics. To build the light, the reader also must have some experience soldering, drilling, wiring and cutting small objects." "This simple Linear circuit provides continuously variable regulated current (~25-400mA) from a 4-6 Volt source. I chose a linear design for simplicity, reliability, ease of repair, and to avoid switching EMI in my Cave Radios. The circuit requires only 0.2V headroom above the parallel LED Array voltage to provide regulation at maximum current. "